Support American police with this subtle heart shaped flag featuring a thin blue line. It would be a wonderful accent on apparel, bags or a tote! 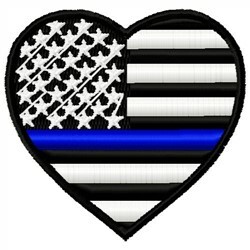 Embroidery Stitches is happy to present Blue Line American Heart machine embroidery design which has 7820 stitches and is [57.15 mm x 55.12 mm] large. If you would like to view more embroidery patterns please search on our embroidery designs page.